I’m travelling at the moment and if there’s one thing you can say about travelling is that it gives you a great appreciation for what you’ve got! Australia truly is the lucky country. There are so many people all over the world who would trade places with you in a heartbeat. And it’s not that other countries aren’t awesome in their own way, but when you’re comparing average Aussie lifestyles with say, poor farmers in South America, our lot seems pretty sweet. I know I’m prone to a whinge now and then, but don’t let anyone say that I’m not grateful for all that I have and for all the opportunities I’ve been given. And one of the things that comes with being as awesome as Australia is, is that there is no shortage of people ready and willing to move here. I was reading something the other day about entire regions in Bulgaria shutting down because everyone had moved away. Literally, whole villages left empty. But that’s not going to be Australia’s fate – not anytime soon. Australia is in high demand. And the population flows prove it. This is their measure of ‘people growth’. It adds short-term arrivals – usually for employment or education – to net overseas migration. As you can see, it’s currently booming. On their measure, we’re currently ‘importing’ a massive 3% of our population, every year. This is the highest number on record. Now you might wonder if this is a good thing. You might wonder if any body has told the people who have to plan for our schools and hospitals and roads and everything. 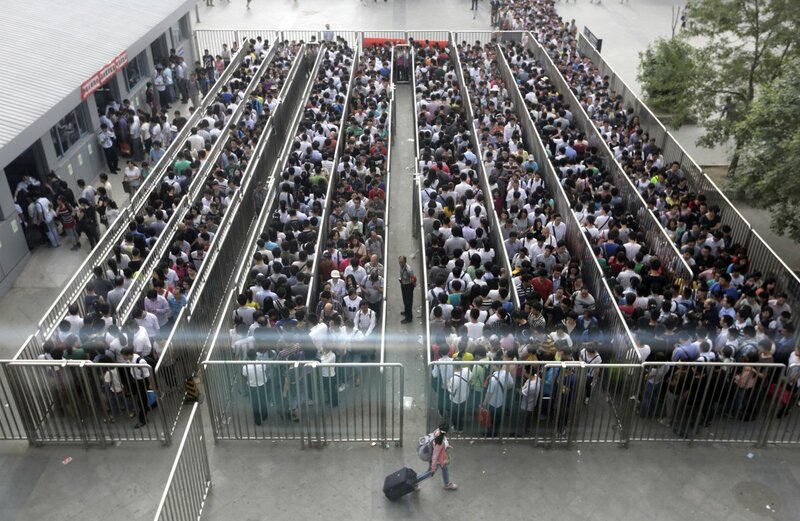 Your morning commute might be hectic enough already. But that’s not going to change it. But one thing I can tell you for sure is that no one has told the builders. Well, not the builders really – but the people responsible for getting houses built – town planners and so on. Because while we’re importing people at record numbers – actually, that’s not exactly true. The number of people we’re importing is at record levels, but so is the immigration intake as a share of the existing population, so we’re importing people at a record rate too. So while we’re seeing immigration flows delivering residents at a record rate, building construction is just not keeping pace. Even when we account for the supposed glut in high-rise apartments. And so even while we’re building “shoe-boxes in the sky” like there’s no tomorrow, we’re still not building enough to offset population growth. Supply is not keeping pace with demand. And what happens when supply is not keeping pace with demand? We also know that because Sydney and Melbourne are in the midst of a “rental crisis”, according to welfare agencies working with the disadvantaged – the first people to be displaced when markets get too tight. 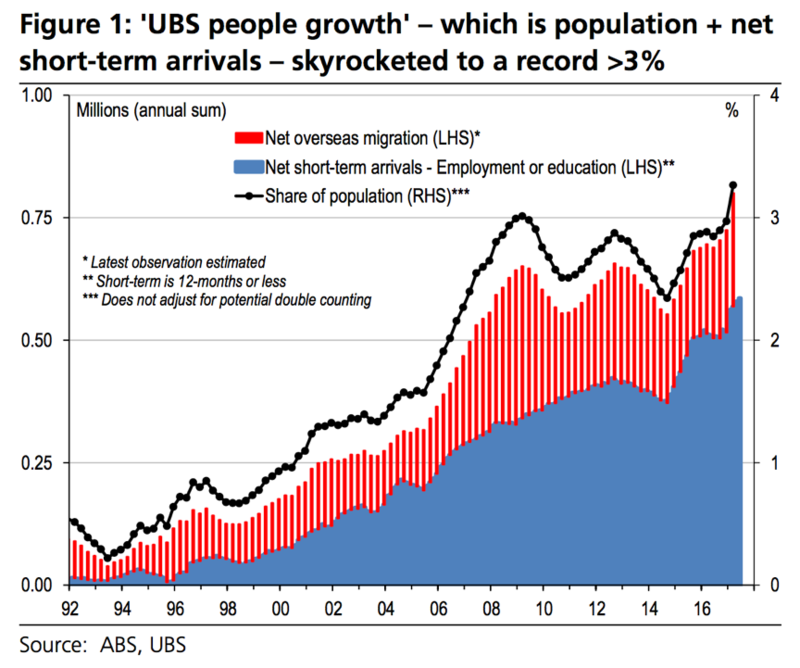 As a final note, it is also interesting to note that this population surge is happening at a time when the Australian dollar is relatively strong. UBS reckon that would normally mean that Australia is a less attractive destination. That means that this scenario has even further potential upside. If the Aussie dollar falls, then potentially we could see even more arrivals. I’m not so sure on this last point. Australia is an awesome place to live no matter what’s going on with the dollar. There are millions of people who would want to live here no matter where the dollar was at. The more likely driver of immigration levels is government policy. It is the government that decides what our intake should be. But on that front, we have no idea what they’re thinking really. There’s no official policy and there’s no discussion. Immigration just is, and don’t ask any questions, thank you. It’s almost like they’re trying to engineer another house price boom. Are you seeing a rental crisis where you are?